Something is afoot at the north end of Enmore Road. It has been racking up a hefty list of newcomers of late, especially on the small-bar front. With the addition of Bar Racuda, the Green Room, and Midnight Special, suddenly there is much more to these few hundred metres than cat-lady op shops. And what with the evenings pretty well covered, the café scene is also upping its game. One of the first off the blocks is the Great Aunty Three, a tiny Vietnamese nook sitting pretty on the corner opposite the Enmore Theatre. 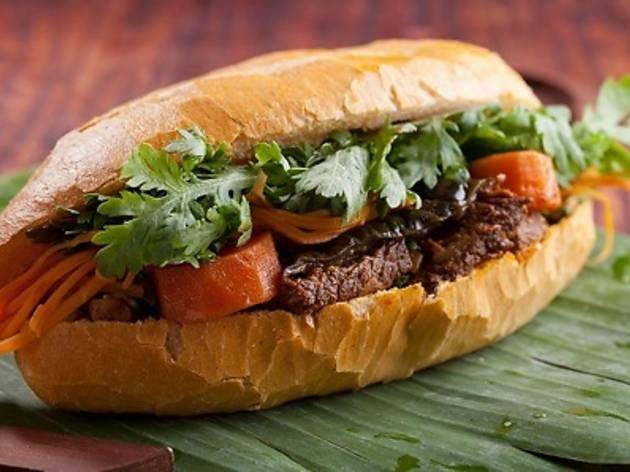 The banh mi are the winning ticket here. 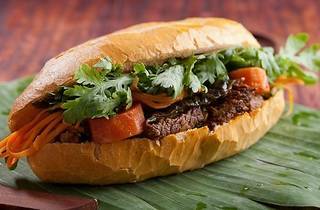 A gussied-up version of the Vietnamese street food, these are slightly bigger than your standard bakery roll, with some fancy fillings. Caramelised pork belly slow-cooked in coconut juice is balanced out by a densely packed salad of shredded carrot, coriander, cucumber, and green onion stems. The addition of slices of tart green apple is a masterstroke and, in the absence of crisp crackling pieces, a sprinkling of toasted pumpkin seeds fills the required crunch quota. The roast pork roll is like an Asian-style pulled pork sandwich. The tender meat comes in a rich, spicy sauce that, unfortunately, overwhelms the salad. It wanted the acidic lift of some nuoc cham to keep it feeling light. The third option is a simple crowd-pleaser – everybody likes sweet chilli chicken. But we recommend doubling down on the condiments and adding some hot chilli sauce too. For something more snack-sized, the fresh rice paper rolls are simple, super-soft fingers of noodles, herbs and your choice of duck, prawn or tofu. It's the fragrant, peanut dipping sauce that really makes these little snack soldiers shine. Been working the proverbial fields all day and in desperate need of a pick-me-up? The fruit shake here is a blush-coloured icy well of tropical refreshment. The combo of lychees, strawberries and watermelon with a whole lot of crushed ice is a guaranteed way to get you safely through the midday heat.